Pot Is Now Legal In Canada. But Admitting To Using It Can Get You Banned From U.S. Canadians say they are being asked at the U.S. border whether they have ever used marijuana. Some were surprised at the result. Canada legalized recreational marijuana in this month, but Canadians can find themselves barred from entering the U.S. if they say they've used it. 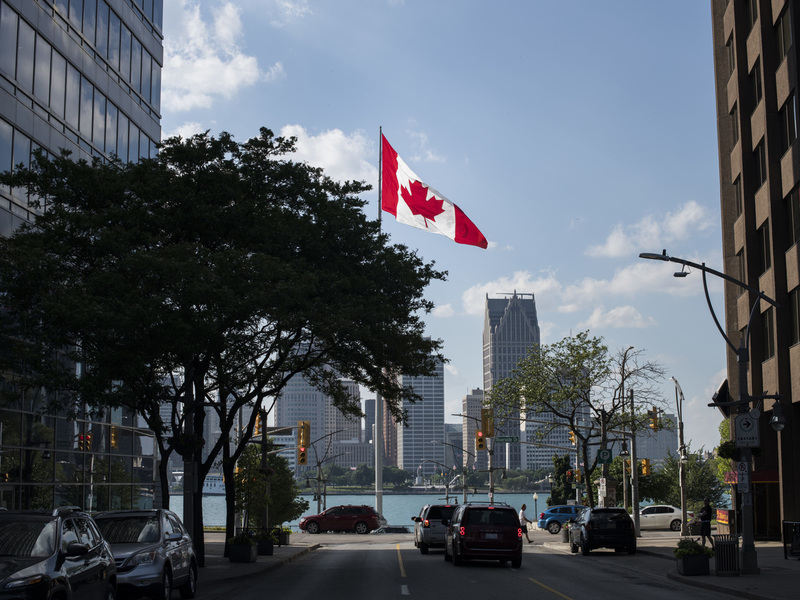 A Canadian flag flies in Windsor, Ontario, in June, with the Detroit skyline visible behind it. "It is a fairly serious concern," Ludwig said. "Even people that might have smoked it 20, 30 years ago, they're being asked, 'Have you ever smoked cannabis?' when they get to the U.S. border. We understand some people have said yes, that they have, and have been turned back." And the concern is not only that they won't be able to enter the U.S. once – but that they can be banned permanently. That's what happened to Bill Powers, a 57-year-old Canadian who has a medical marijuana license, The Los Angeles Times reported. Border agents asked if Powers had ever smoked pot before getting the license. When he said he had, he was labeled "inadmissible" and barred from entering the U.S.
"I thought they were kidding," he told the newspaper. "They're treating people like terrorists when all we did was admit to smoking some pot." A few of the reasons concern drugs, and can potentially apply at the border to non-U.S. citizens who admit to having used marijuana, depending on the situation. One blocks entry to noncitizens who are determined "to be a drug abuser or addict." Another bars those who have been convicted of crimes involving controlled substances. A third bars those whom officers have reason to believe "is or has been an illicit trafficker in any controlled substance." CBP spokesperson Stephanie Malin tells NPR that "on the U.S. side, nothing has changed." Despite legalization in a number of U.S. states and the District of Columbia, marijuana remains a controlled substance under federal law. She says that every inspection is different, and not everyone will be asked about drug use. "However, if during the course of the inspection, there is reason for the officer to ask about it, they will. ... It comes down to the intent of the travel." In October, CBP issued a statement regarding Canadians working in that country's legal cannabis industry. Canadians working in that industry in Canada may only travel legally to the U.S. if their travel does not involve the marijuana business. The Canadian government warns travelers that the U.S. "has a zero-tolerance policy and imposes severe penalties for the possession of even a small amount of an illegal drug." The CBC reports that the Canadian government "will post signs at border crossings warning Canadians not to bring their legal marijuana into the U.S. — just as the Americans do for their citizens with signs informing them of Canada's strict firearms regime." The CBP doesn't track how many Canadian citizens have been barred from entering the U.S. for marijuana-related reasons. But Malin says that the CBP has "not seen a noticeable spike" in Canadians turned away at the border this year. "Refuse to answer the question. Say it's irrelevant. Say you don't know why this question is being asked," Chang told the CBC. They won't be able to enter the U.S. on that occasion, he says, but they will be able to go and consult with a lawyer who may be able to resolve the situation. Asked if the CBP's stance might be too severe, Malin says that her agency is simply enforcing U.S. immigration law. And while the law could change, she says, there is no indication that the agency will change how it enforces the current law.